Endless Summer Wooden Swimming Pools. These deluxe above ground Endless Summer Wooden Swiming Pools are available in 3 standard sizes,4.2m x 4.2m,6m x 4.2m & 4.7m x 2.9m with bespoke sizing available on request. 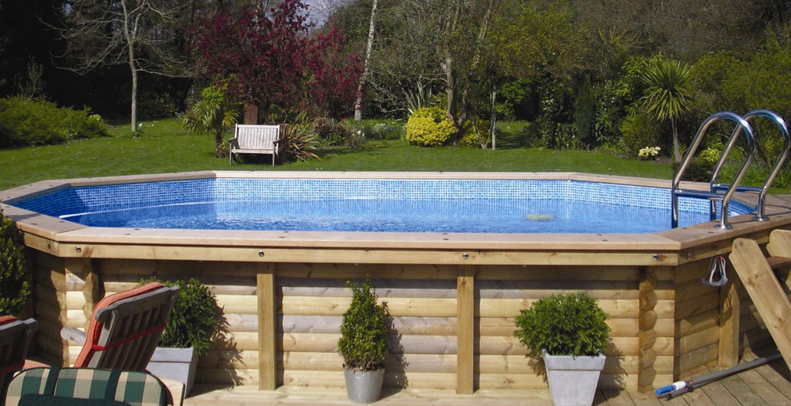 Made from scandinavian redwood ( walls and top) to the highest standards, the pools have no side buttresses which can take up additional space and do not require any concreted-in steel supports, making for an easier installation. All Endless summer pool packages come complete with Steps, flow fittings,filtration equipment,maintenance kit,cover and 30thou gauge liner as standard, fully patterned liners are available at extra cost. Air pockets and air blowers are avialable as optional extras. For more competitive swimming there are pool packages available including Fast Lane counter current units. Prices and details of the standard kits are shown in our webshop. Please note: Pools and Gardens Ltd will only construct swimming pools within approximately a 40 mile radius of Droitwich, Worcestershire.